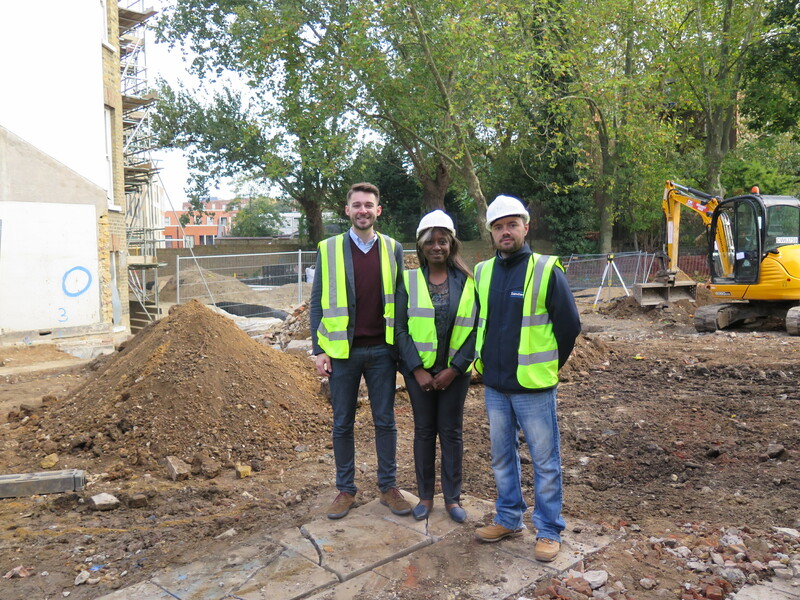 Work has started to provide nine new homes at social rent through the restoration of two Victorian terraced houses and building three brand new PassivHaus homes in Brixton. The £1.9m scheme at Akerman Road, Lambeth will be the first new build council housing delivered directly by Lambeth council for ten years. The project is being funded partially through Section 106 money that comes from planning developments and through a successful grant bid to the Greater London Authority’s Local Growth Fund. One of the existing houses, number 56, was home to music hall legend Dan Leno between 1898-1901 and in more recent years the houses were used to provide temporary hostel accommodation for homeless people. Now the heritage protected buildings are being restored by construction firm Sandwood Design and Build and architects Anne Thorne Architects with 15-40 Collective to provide social rented homes for local people. The vacant adjoining site was bomb damaged in World War II, and three new four bedroom PassivHaus homes will be built to complete the terrace of houses. The PassivHaus system, developed in Germany means the buildings are extremely energy efficient thanks to meticulous attention to detail in the construction and use of materials. For tenants this will mean much lower energy bills and a warm, healthy home. Cllr Matthew Bennett, Cabinet member for Housing said: “This is an imaginative scheme that marries old and new, protects Lambeth’s heritage and secures badly needed homes for local people. The Akerman Road scheme is due for completion in the summer of 2016.